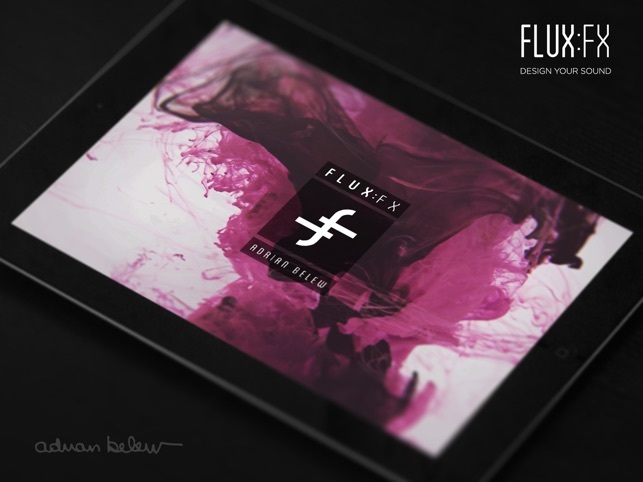 Designed in conjunction with acclaimed musician Adrian Belew, the award-winning FLUX:FX is a professional multi-effect processor app for the iPad that lets you ‘play’ your effects. 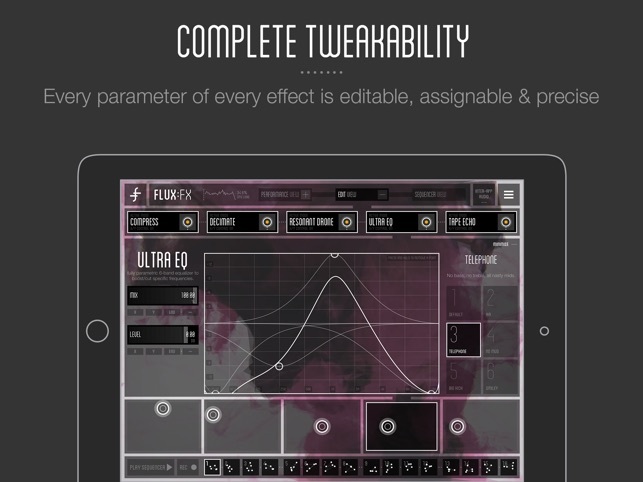 Innovative, intuitive and exciting, FLUX:FX lets you manipulate your audio signal into something entirely new, and redefines the possibilities of studio sound design and live performance in an app with a massive range of effect options. Guitar, bass, synth, drums, vocals, DJ setup, violin… basically ANY audio signal can be processed in real-time by FLUX:FX. 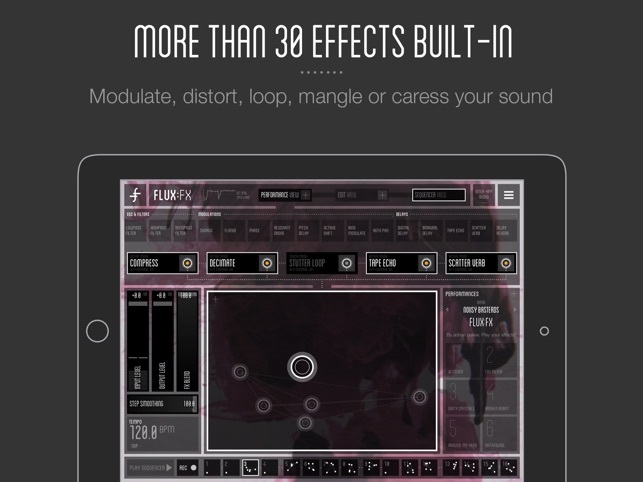 TRULY CREATIVE EFFECTS: FLUX:FX has 31 studio-quality effects to choose from, and an almost unlimited range of settings to let you twist & sculpt your sound. Chain 5 together for maximum aural impact. POWERFUL SEQUENCER: A touch-based automation sequencer for your effects that adds a completely new fluid dimension to your sound design. DEEP EDITING HEAVEN: Every parameter of every effect is editable, assignable and with the fine tuner dial, precise. That makes FLUX:FX a tweaker’s paradise. 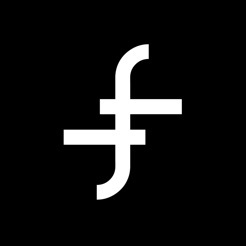 TRANSPARENT INTERFACE DESIGN: FLUX:FX has a beautiful, minimalist interface with easy-to-use controls that are MADE to be touched. And swiped, and dragged, and tapped. No fake road-worn pedal graphics or tiny dials here. MADE BY EXPERTS - conceived and created via the combined talents of guitarist extraordinaire Adrian Belew, audio software developers ElephantCandy and mobile specialists MOBGEN. 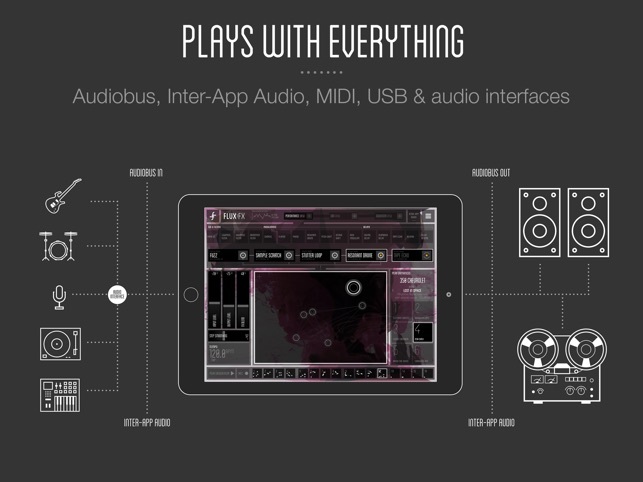 PLAYS WITH EVERYTHING - Audiobus compatibility (including saved states), Inter-App Audio compatibility, MIDI, virtually all the audio interfaces… they just work with FLUX:FX. 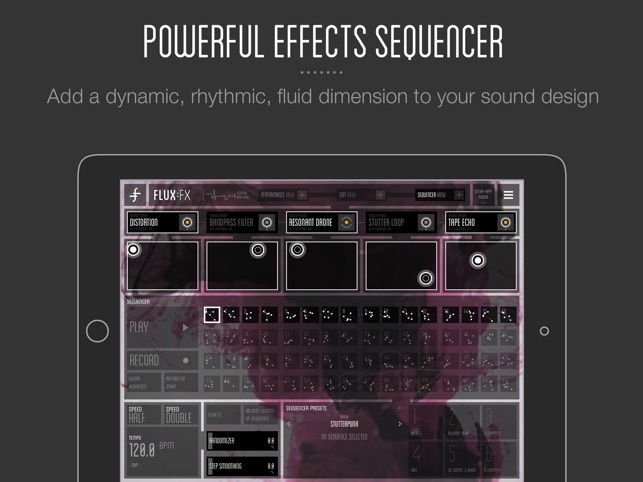 COMPLEX SOUND, EASY TO USE - chopping, shaping, crushing and looping – FLUX:FX can take you from subtle modulating echoes through to wrecking-ball destruction, all with a swipe of a finger. ULTRA LOW LATENCY - FLUX:FX features very low-latency settings to give truly professional performance capabilities. Plus a master LIMITER to keep all the sonic chaos in check. ”FLUX:FX makes sounds that I have never heard before from any other piece of equipment. It can truly mangle any signal you put into it… in a good way! I can actually PLAY the effects. This app is just so creatively inspiring & fun to use.” - Adrian Belew: the world’s greatest experimental whammy twang bar, czar rhino, stunt guitarist extraordinaire. With a resume that includes Frank Zappa, David Bowie, Nine Inch Nails, King Crimson, Talking Heads, Paul Simon and Tori Amos, Adrian is famous for pushing the boundaries of the guitar in both technical and tonal exploration. "It's really awesome, and the SFX and way to automate things is splendid. 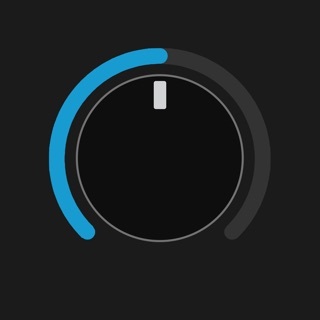 I love the GUI too, very nicely laid out." - Richard Devine: producer, sound designer, film & game music composer. As seen in Sound on Sound, Guitar Player, KVR, MusicRadar, Keith McMillen Instruments, Sweetwater, PalmSounds, Synthtopia, iOS Mars, Audiob.us, Apptronica, SonicState, ANR, Guitar Moderne and many more! At first, I could not get this app to work at all, it just crashes in audiobus 3, and in standalone mode all input/outputs are greyed out and unselectable. I gave up for a week or so.... then tried to open in Cubasis 2, bam, works, mostly. You have to slap on a lowpass filter, and leave it always on, it was the only way I could make the input audio stop crackling, takes up one fx slot, but if you set the filter just right it doesn’t affect sound much, just eliminates the crackles and makes flux:fx completely usable and awesome. Please update! I’ll pay you lol, maybe an option to use other stuff in effect slots, like audiodamage effects and such. That would make this a 30 dollar 6 star app. Thanks either way, don’t let this one die. it’s not a #FakeApp ... like not at all. This is a great effects suite, a little hard for me to quickly understand and navigate the interface, but there are lots of unique sonic possibilities. Now 64 bit just in time. The one issue is the effects sequencer, although an interesting feature, the record functions are limited and incomprehensible to get it to do what you want.